The Pelion peninsula in the region of Central Greece, is one of the most beautiful and unique parts of the entire country. It is a place where myth meets nature, and the stunning landscape is a treat to all who visit this truly majestic region. The perfect combination of mountains and sea make Pelion an ideal holiday destination throughout the year. Situated along the coast of the Pagasitic Gulf, 46km from the port city of Volos, is the charming and picturesque coastal village of Kalamos. 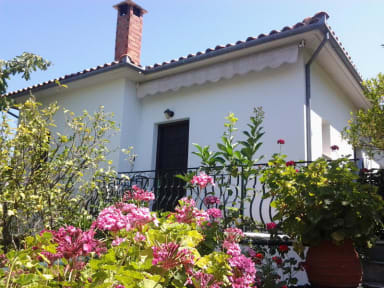 It is here that you will find 'Margianou' Hostel from which we welcome you to Pelion and look forward to offering you a wonderful selection of accommodation. It’s a small two-storied building, of local Architecture, located on a beautiful hillside of a quiet environment, from where it offers a plentiful view in the beach and the light blue horizon of this Gulf. Wi-Fi Internet, Grill of BBQ, TV, Air-conditioning, towels, sheets - linen change, soap, final cleaning and VAT include in rental price.